PTCL has launched EVO 3.1 re-connect promo to offer discounted monthly tariff for whole year. For all prepaid and postpaid inactive EVO customers. If you are a PTCL EVO 3.1 user and have not paid your EVO bill since 30th of June, 2014 then you can avail this offer by paying Rs. 500 only. Re-Connect your EVO 3.1 and clear your outstanding bills by paying just Rs. 500 and get discount on your monthly bill for 1-year. Rs. 500 per month with 20 GB monthly data limit. Additional usage at Rs. 0.15/MB on prepay and Rs. 150/GB on postpaid. Offer is applicable for all EVO 3.1 subscribers inactive since 30th June, 2014. 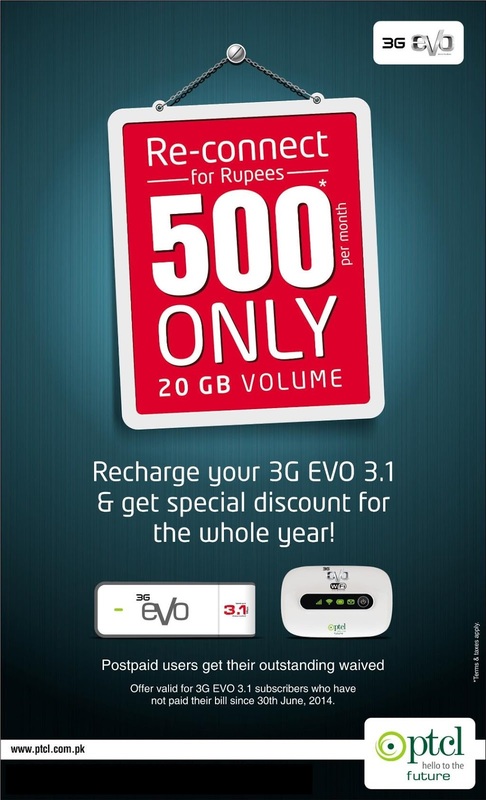 Offer is valid for EVO 3.1 USB & EVO 3.1 Cloud subscribers only. Discounted monthly line-rent is valid for a period of 1 year.